The Silver Falls by George Sims and Henry Pettitt. 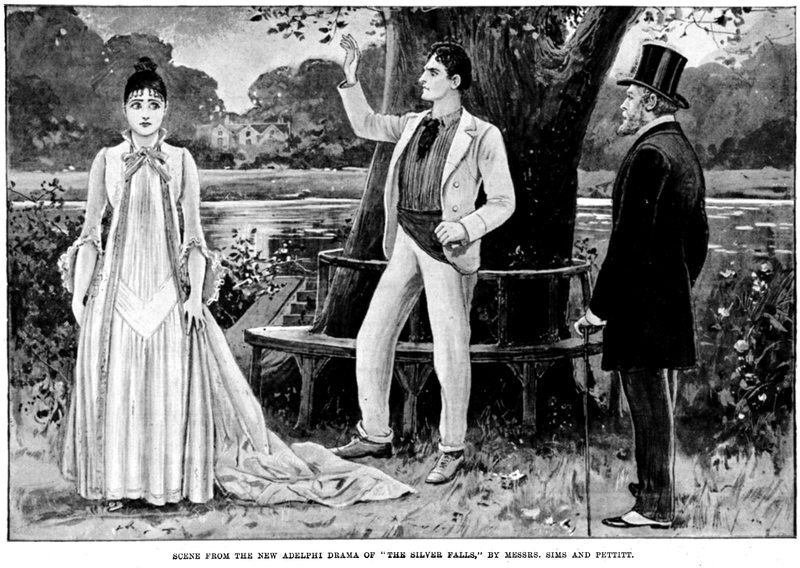 In this scene, William Terriss discovers beautiful Lolla (Olga Nethersole) is an unscrupulous adventurer who, he believes, had been murdered by a rejected suitor. Eric Normanhurst was played by William Terriss and Primrose Easterbrook by Jessie Millward. Terriss' future murderer, Richard Archer Prince, played Diego. "THE SILVER FALLS" AT THE ADELPHI. The dramatic partnership of Mr. George R. Sims and Mr. Henry Pettitt is to be credited with yet another Adelphi success in the powerful new drama of "The Silver Falls," which opens on the beautiful riverside lawn depicted and closes amid the romantic mountain scenery of Mexico. Messrs. A. and S. Gatti, who have transformed the Adelphi into one of the safest and most elegant of our electric-lighted theatres, spared no expense in mounting "The Silver Falls." The story is that of Eric Normanhurst, one of those dashing heroes Mr. William Terriss represents with declamatory force. Espoused to the beauteous Mexican girl Lola (enacted to perfection by Miss Olga Nethersole), Eric Normanhurst learns too late in this riverside scene at Richmond that his wife is an unscrupulous adventuress. She had, indeed, on this very spot a short time previously been interviewed by an infatuated Mexican lover of hers, one Marcos Valles, a refugee from justice. Deserting his adventuress wife, Normanhurst flits to Mexico, where he soon falls in love with fair Primrose Easterbrook (the most captivating heroine Miss Millward has ever embodied) and, hearing from Marcos Valles of his wife's death, marries his new love--only to meet Lola face to face in his new home on his wedding night. The way to eventual happiness is opened to Eric and Primrose, however, by the murder of Lola by Marcus Valles (powerfully and cleverly individualised by Mr. Charles Cartwright), and the interesting play ends with an exceedingly effective scenic representation of "The Silver Falls." A word of praise should be added for the Hibernian geniality of Mr. J. D. Beveridge as Bob Maguire, and for the vivacity of sparkling Miss Clara Jecks and merry Mr. J. L. Shine, who, as Norah and Jack Slingsby, furnish the light comedy of this successful play.